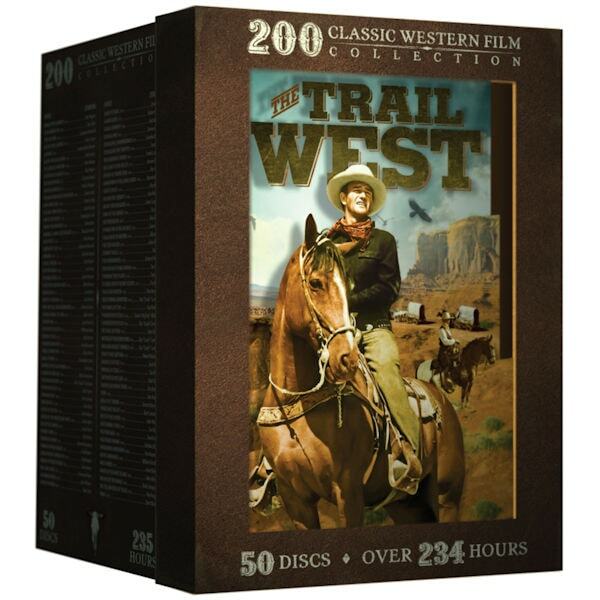 Saddle up for 200 stories from the untamed West, a time of shoot-ups, showdowns, and famous names including Billy the Kid, Annie Oakley, Jesse James, Zorro, and the Lone Ranger. The stars are a list of Hollywood legends: John Wayne, Roy Rogers, Gene Autry, Clark Gable, Errol Flynn, Jane Russell, Ronald Reagan, Maureen O'Hara, James Caan, and many more. The films span nearly 60 years of Hollywood's love affair with the West, from Westward Bound (1930) to Gone with the West (1978). 235 hrs, 50 DVDs. Color and B&W. John Wayne, Roy Rogers, Lee Van Cleef, Gene Autry and many more!